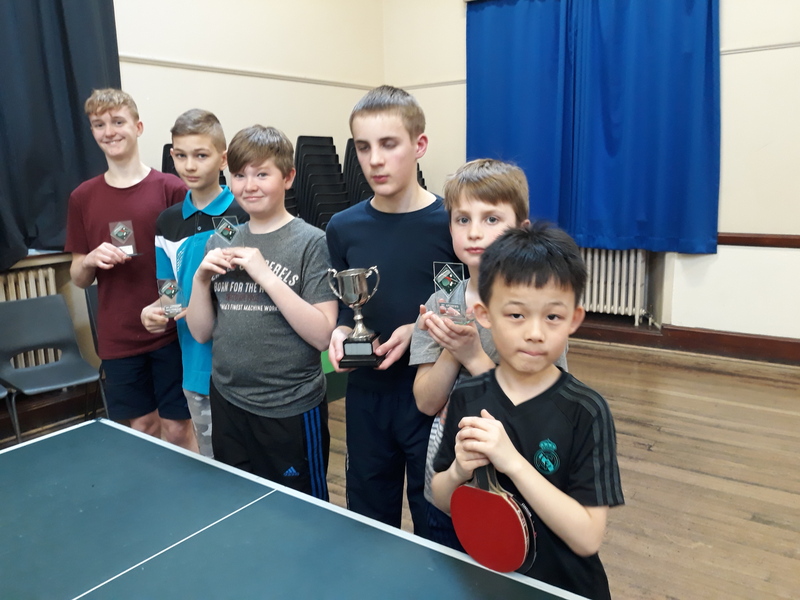 On Monday, St Andrews Table Tennis Club hosted their third annual ‘hardbat’ tournament, using sandpaper bats and adopting the style and format used by the World Championships of Ping Pong. Top seed Michael Hahn was victorious, but did not have everything his own way, losing his first group game to Chris Wroniecki 21-12, before recovered to beat both Alain Leger and John Carlton to 12 and 14, respectively. John beat Chris to give a three-way-tie between Michael, Chris, and John for first place, with Chris taking this countback. In group 2, last year’s winner, Graham Wood and Collin Bleak both beat Neil Lea comfortably, while Graham came back from 19-17 down to edge out Collin 21-19 to take top spot. In group 3, Howard Lee won all of his games, although struggled against Nick Shepherd and Emma Bissett, winning 21-19 and 21-18, respectively. Nick won his other games while Dave Beveridge beat Emma to go through as third. The bottom players from each group, Neil, Alain, and Emma played off in a round robin group, with Alain winning with 21-19 and 21-12 victories against Emma and Neil, respectively, while Emma beat Neil 21-20. The other players entered the quarter finals. Chris and Michael beat Nick and Collin fairly comfortably in their respective games, while Howard won a close contest against John 21-19 and Dave came through against last year’s champion, Graham in an even closer 21-20 game. The losing quarter-finalists, Nick, Graham, John, and Collin played off for positions five to eight with everyone winning at least one game, and Nick taking 5th place overall with two wins from three. Chris beat Dave 21-16 and Michael beat Howard 21-17 in the semi-finals to set up a repeat of the first game of the night in the final. Dave beat Howard to take third place. Michael started well in the final to gain a small advantage by the half-way stage, and maintained that lead for the rest of the game to gain revenge and win the final 21-18. Chris should be commended for his good play throughout the night, especially as he only joined the club this year. Thanks go to Howard Lee and Elaine Forbes for running the event. Last week, Swots finished their season in slightly disappointing fashion, losing to Division One team Rockets in the final of the Handicap Cup, however should be proud of their performances to take them that far. Playing each game in two sets up to 26 points, Emma Bissett and Dave Beveridge started on 15 points and Collin Bleak on 14, while their opponents Gary Lowson and Pete Yearworth started on 5 and Peter Dixon started on 6. Emma got a good start beating Peter 26-23 but then lost the second set 26-24. Then Gary, the best player on the night, beat Dave in two close sets to give Rockets a 3-1 lead. Pete then won two sets against Collin and Gary won another two against Emma to extend this to 7-1. Collin won a sudden-death point to win the first set against Peter 26-25 and won the second set more comfortably 26-16 to make it 7-3. Dave lost the first set comfortably to Pete but won another 26-25 set to make it 8-4. Gary then won both sets against Collin to close out the fixture and give the cup title to Rockets, doing very well to remain undefeated on the night. 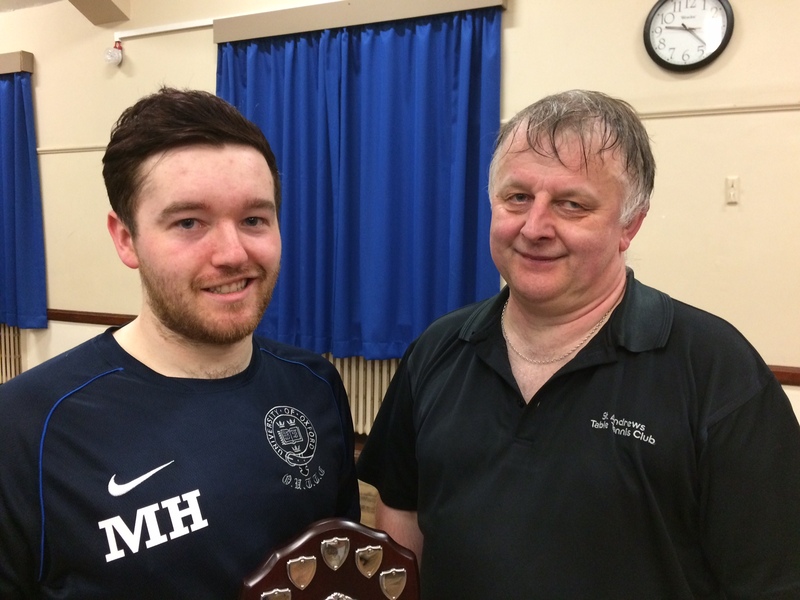 This entry was posted in Match reports, St Andrews Table Tennis Club on April 18, 2018 by standrewstt. Edward Coles (4th from the left) is pictured with the Grove Trophy while the other boys display their participants’ mementos, which were kindly donated by club member, Sandy Pearson. Unfortunately the Paterson brothers were not available for the photoshoot. The members of St Andrews Table Tennis Club’s youth coaching group recently competed for this season’s Grove Trophy. After an exciting final a new name was engraved on the trophy, with Edward Coles defeating the 2016 champion, Murray Paterson. It was fine performance from Edward who was unfazed by reaching the semi-finals as the second placed in his group matches. The losing semi-finalists were Keir Paterson (finalist in 2016) and Michael Snodgrass (finalist from 2017). As usual, all the boys displayed a high standard of sportsmanship over the course of the night. 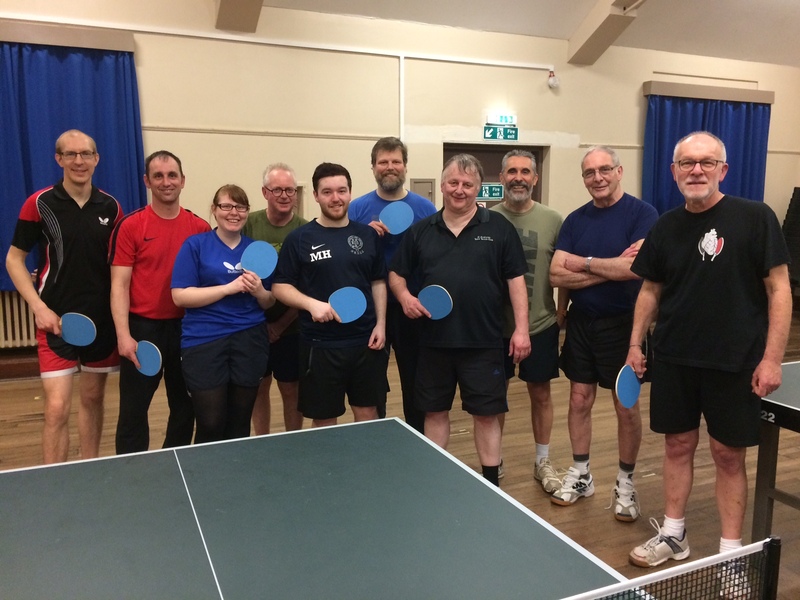 This entry was posted in Match reports, St Andrews Table Tennis Club on April 3, 2018 by standrewstt. In the final week of league fixtures in the Dundee and District Table Tennis League, St Andrews team Swots needed four points to avoid relegation to Division Three in their fixture against Comets. Nick Shepherd and Collin Bleak started with fairly comfortable 3-1 and 3-0 wins against Dougal Ogilvie and Glenn Christie respectively, and Dave Beveridge and Collin then came through in two 3-2 wins against Fraser Smith and Dougal, to obtain their required four wins in the first four matches of the night. Nick extended the lead to 5-0 with a 3-1 win against Fraser and the pair of Collin and Dave beat Glenn and Fraser 3-1 in the doubles, but the remaining four games went to Comets. New Kids lost 7-3 on two occasions, against leading Division Two teams, Villa and Brechin. Against Villa, cadet David Hay was too strong for the New Kids trio of Howard Lee, Ian Smith, and Kong Wan, not dropping a set. Howard and Ian both managed to beat Ian McLagan, Ian 3-1 and Howard 3-2 (coming through a close fourth set 15-13 when 2-1 down). Ian managed a good 3-2 win against Sandy Bertie and Howard was just denied the same victory, losing 12-10 in the fifth to Sandy. Against Brechin, it was the same number of wins for each of the New Kids players, and the same overall result. Howard and Ian both lost comfortably to John Anderson and beat Aaron Robertson in five sets, Ian in a very close 14-12 deciding set. Ian got an incredible win—maybe the best individual win for any St Andrews player this season—against Derek Mitchell, Derek having only previously lost three matches this season. Truants managed a dominant 8-2 win against Tigers. Sascha Roschy won all three of his singles games for the loss of only one set to Scott Thomson. Scott had previously defeated both Alain Leger and Graham Wood. Alain and Graham were both successful in their two other games against Kenny McLaren and Marion Davidson, and Graham and Sascha teamed up to win the doubles 3-1 against Scott and Kenny. Prospects finished their season with a 5-5 draw against Tass. Chris Wroniecki was in excellent form for Prospects, beating Stewart Clark 3-2, Robert Fortheringham 3-0, and Jim Wotherspoon 3-1. Dave Goddard managed the other singles win, recovering from 2-0 down to win 13-11 in the fifth set against Robert. Dave was unfortunate not to get a second win, losing out 11-9 in the fifth to Jim. Despite his best efforts, Neil Lea was unable to win a set on this occasion. In the doubles, the pair of Chris and Dave managed a good 3-0 win against Stewart and Jim, including a 17-15 first set.